This textbook provides a modern, quantitative and process-oriented approach to equip students with the tools to understand geomorphology. Insight into the interpretation of landscapes is developed from basic principles and simple models, and by stepping through the equations that capture the essence of the mechanics and chemistry of landscapes. Boxed worked examples and real-world applications bring the subject to life for students, allowing them to apply the theory to their own experience. 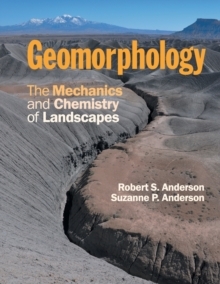 The book covers cutting edge topics, including the revolutionary cosmogenic nuclide dating methods and modeling, highlights links to other Earth sciences through up-to-date summaries of current research, and illustrates the importance of geomorphology in understanding environmental changes. Setting up problems as a conservation of mass, ice, soil, or heat, this book arms students with tools to fully explore processes, understand landscapes, and to participate in this rapidly evolving field.